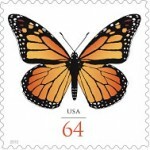 The Post office introduces a new Monarch butterfly stamp at the National Stationery Show. The purpose of this stamp is to make it easy on people who buy cards that need extra postage. Companies will begin putting a soft impression on envelopes to alert customers that the postage will be .64 cents.